Caroline Chaffin, a Norwegian student who is about to graduate with an MBA degree in Service Innovation and Design, wanted to do something different for her Master thesis. With a previous background from Healthcare and Social entrepreneurship, she wanted to find a case company with a social purpose, which allowed her to work close with the end-users of the service offering. She states that: «When working as a social entrepreneur, nurse or service designer, what I find in common is being an ambassador for the end-users, and having the ability to create real value, for real people. This was a requirement when starting my thesis journey». Caroline is an active networker and found the case company for her thesis, by attending the Norwegian Social Entrepreneurship conference, in Oslo February 2014. The conference was hosted by one of Norway’s largest investors within the field; FERD, and Monsterbedriften won the title as social entrepreneurs of the year. Monsterbedriften is a Norwegian social entrepreneur, who wants to help former prisoners and people who have not completed their education, or have trouble getting work. Helping youth who are found among a marginalized group in the society, is an important target group, which has increased in Norway during the last decade. Caroline used Monsterbedriften as a case company in her thesis, and the focus was on the internal customers. In the case company the internal customers are the staff, and can also be considered as end-users. This is argued by the company’s vision: to help as many people as possible get a new start in life and pay it forward, which emphasize giving staff, a life outside unemployment, drugs and criminality. Monsterbedriften’s service offering towards internal customers involves work experience, housing, coaching and a family environment. Unlike traditional businesses where the service takes place during a specific time, the service offering in Monsterbedriften often becomes «the staff´s entire world», and they have their own values (Monsterbedriften values). The title of Caroline’s thesis was: «Enhancing engagement of internal customers in a social business through extensive use of visualization». The purpose of her thesis was to enhance engagement of internal customers in a social business. The aim was to apply service thinking, service design methods and visualization tools for enhancement of customer engagement. The project took place from February-November 2014. An overview can be found in Model 1. Model 1: Purpose and aim of thesis. Since Caroline’s thesis was an academic study, it consisted of a theoretical part and an empirical part. The theoretical framework is found in Figure 2, and was chosen based on her pre-understanding of the fields social entrepreneurship and service design, as well as insight gathered from the case company, in the empirical part. Caroline believes that the theoretical combination in her study has not been attempted before, and turned out to support her thesis work well. Figure 2: Theoretical framework, applied in thesis. The empirical part in her study was referred to as a service development project. This is a hands on project, that aims to give students practical experience, so they can create new knowledge or innovations, which can be used elsewhere. In the service development project, Caroline applied action research with a service design process, tools and methods (Model 2). 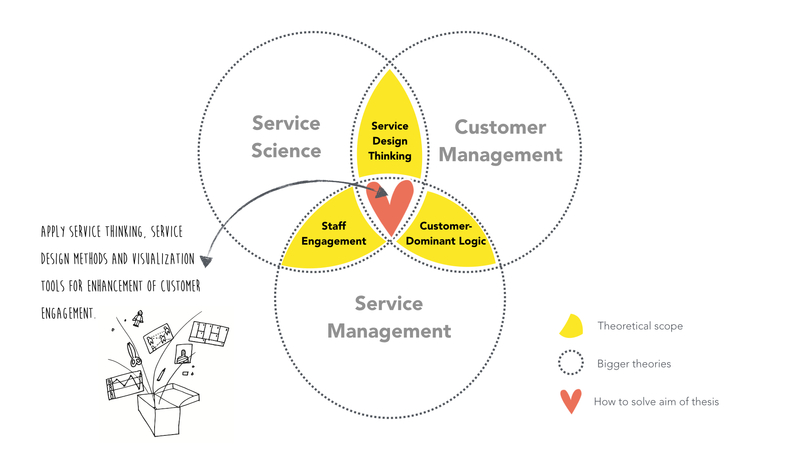 The service design process was inspired by the Double Diamond process, and incorporated elements from different design practitioners. 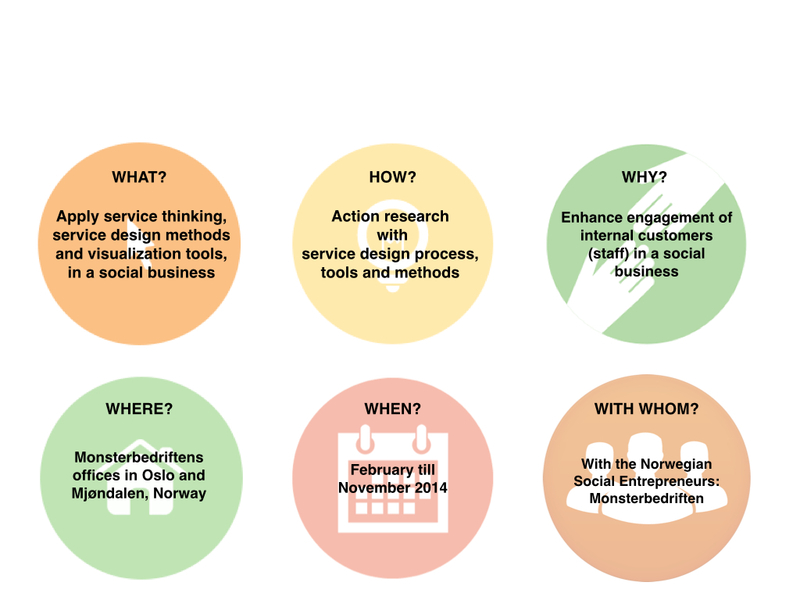 Model 2: Action research with a service design process, tools and methods – applied in thesis. In order to enhance engagement of internal customers, Caroline saw a need to iterate current service design tools and methods, to fit the needs of a social business. She ended up creating an «Engagement tool-kit for social businesses» which uses visualization tool and methods extensively. The tool-kit was designed and tested in a pilot company Epleslang, and was iterated (changed) based on real user feedback. 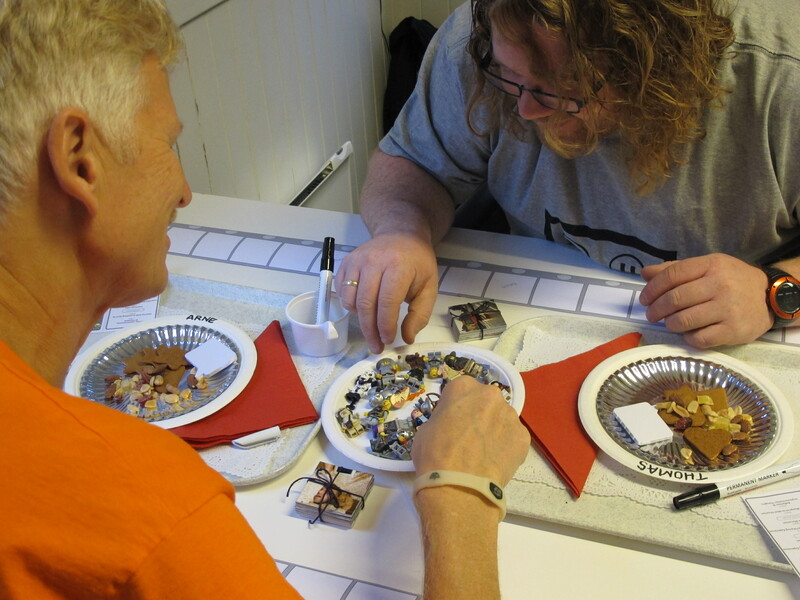 Pictures from developing prototype, and testing it in pilot company; Epleslang. By testing a rapid prototyping in a pilot company, Caroline was able to get valuable feedback in terms of using visualization extensively, with internal customers in a social business. She also received valuable feedback regarding the tool-kit elements, which resulted in a second version. Iterations made on tool-kit elements, based on feedback from pilot test. Get feedback on the tool-kit elements, for future application in other businesses. 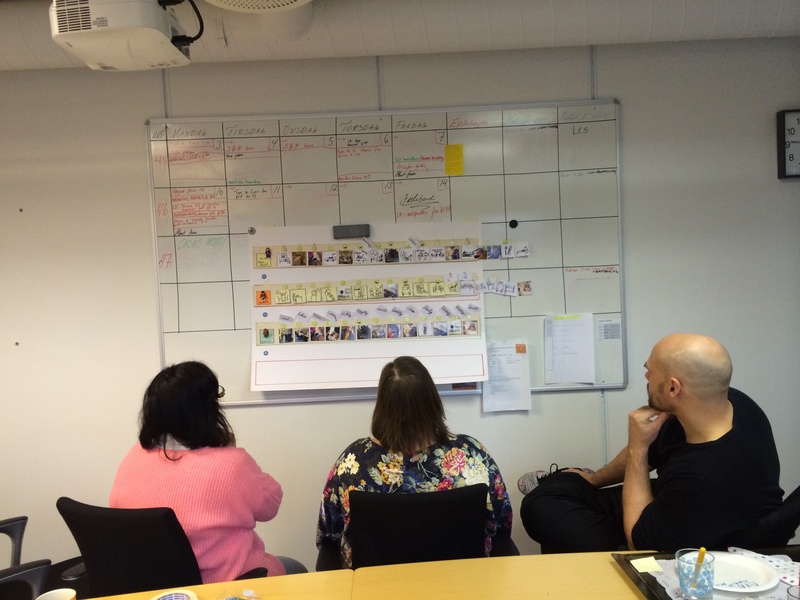 Pictures from introducing the Engagement tool-kit, to the case company, in the delivery phase of the design process. Application of action research with service design thinking, found that the case company were experiencing rapid growth, and chaos. The case company described the service designer as «a catalyst», who helped them view their business from an outside perspective, and invest time in service improvement. By gaining a holistic view of their business, the case company was able to clarify needs and make a premeditated plan on how to support and engage internal customers, so that they can move on to a life outside the business. The premeditated plan specified what each person should do, individually and together, towards implementation. The case company were able to identify the social value that needs to be present during their service offering. By doing so, they were able to identify the context and people who will support internal customers in reaching individual goals. 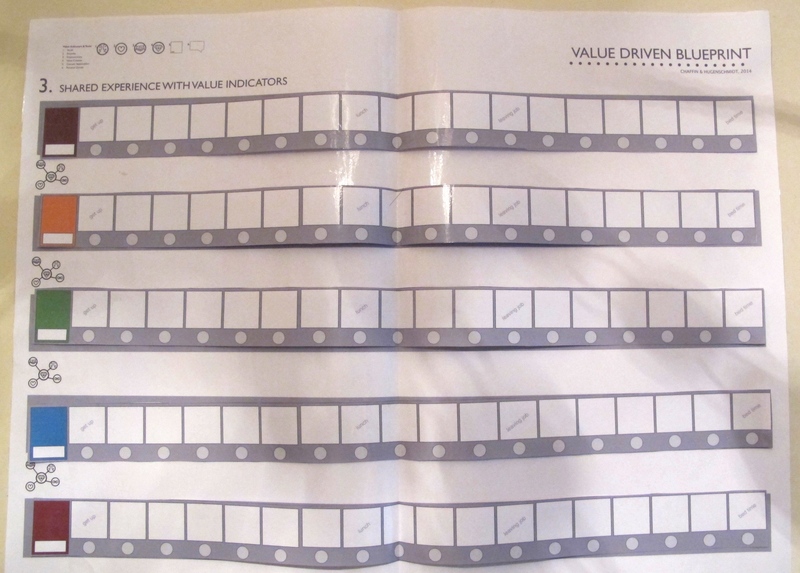 By using visualization extensively, the case company were able to map out the experience of internal customers, the case company were able to make a «Step-by-Step guide» that highlights what the case company must focus on, in order to help internal customers get a new start in life, and pay it forward. This guide is also considered as «information material». 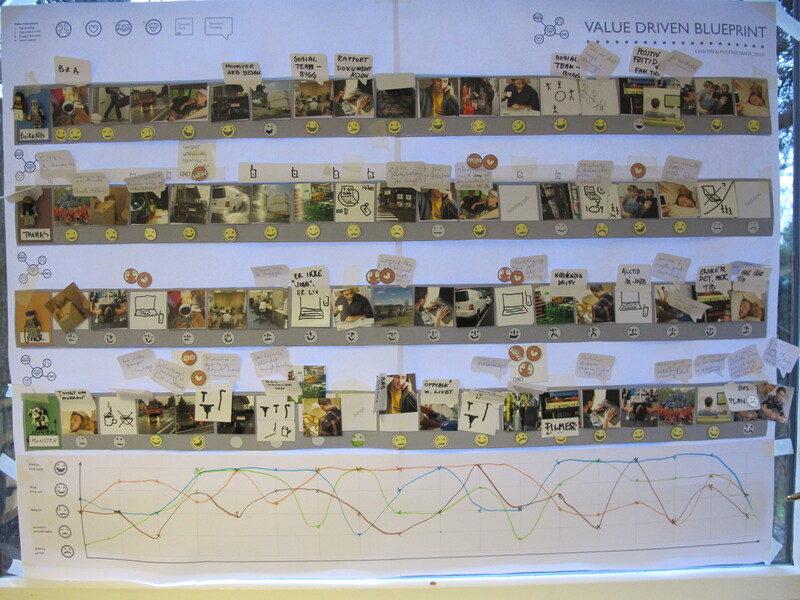 The case company wanted to use the applied service design tool «Insight poster» to find themes to discuss with internal customers, since the poster was based on their insight. 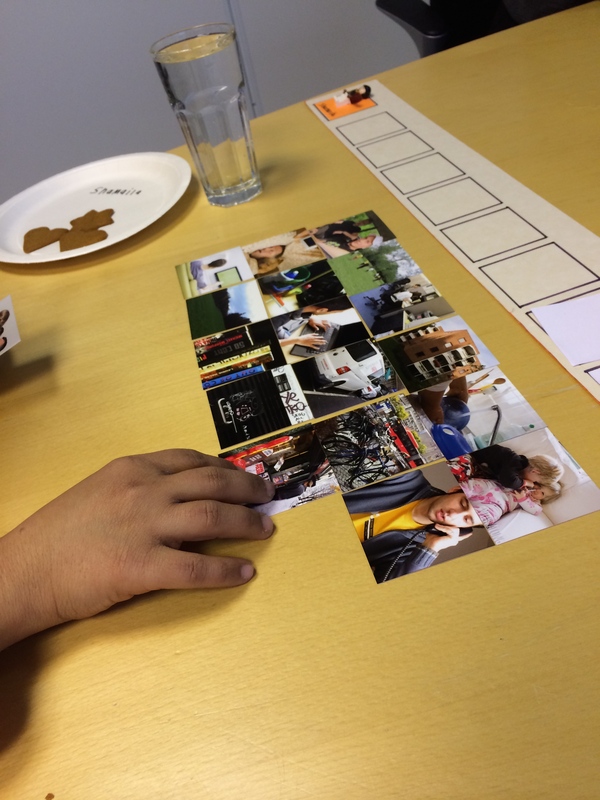 The case company refereed to this as using social team building with themes, as treatment. The company also wanted use the poster in evening meetings (which was the identified context to engage with staff), as well as in board meetings and in BAS leader meetings. 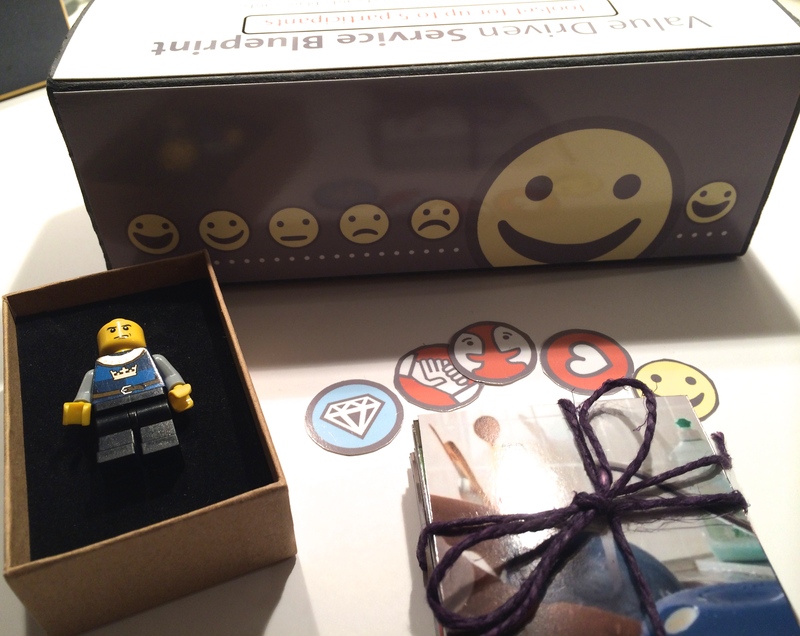 Use of the Engagement tool-kit and application of service design tools gave substance to the idea «DIY Personas». The ideas was inspired by the tool Persona, and the aim was to empower internal customers to identify their own «readiness» for a life outside the business. The DIY Personas can also help the case company identify solid working teams within the field of construction, which is important in terms of HSE, and other development areas, identified through this service development project. 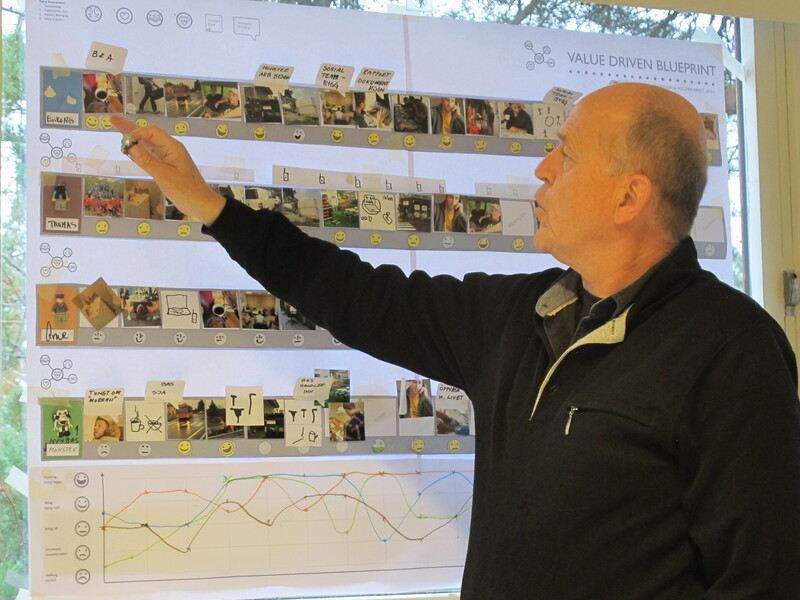 By applying the tool-kit in two social businesses, the author got concrete feedback on the engagement tool-kit in terms of the overall structure, applied cards and symbols. 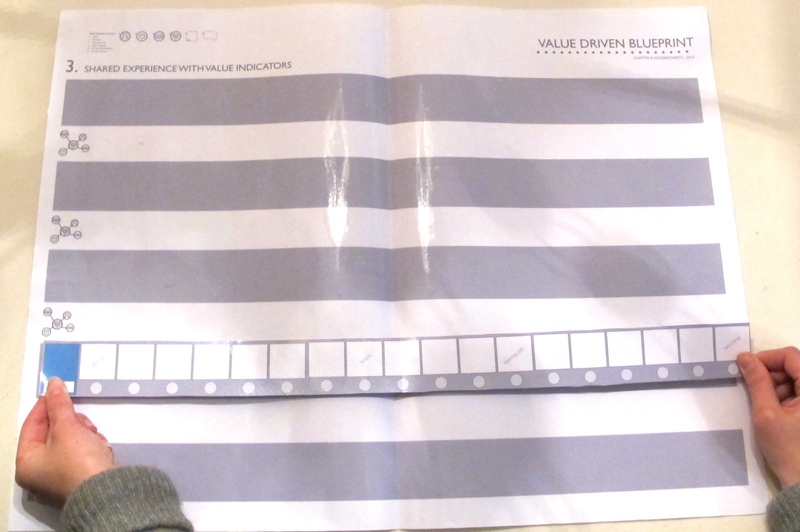 This feedback was used to iterate the tool, so it has potential to be used in other businesses, in the future. By using visualization extensively, the case company experienced that they were able to enhance into the world of their internal customers, and construct their service according to actual needs. 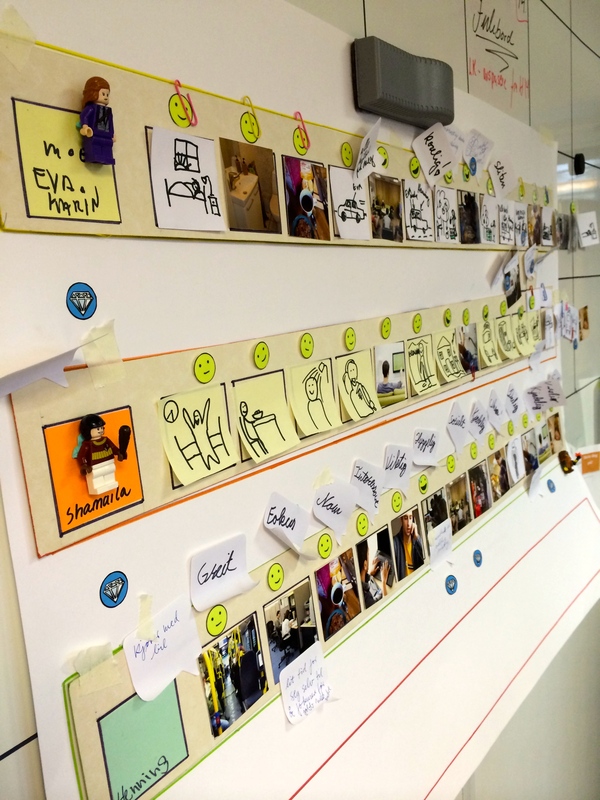 The thesis project became more extensively than planned, as Caroline ended up making an «Engagement tool-kit for social businesses», that applies visualization tools and methods extensively. 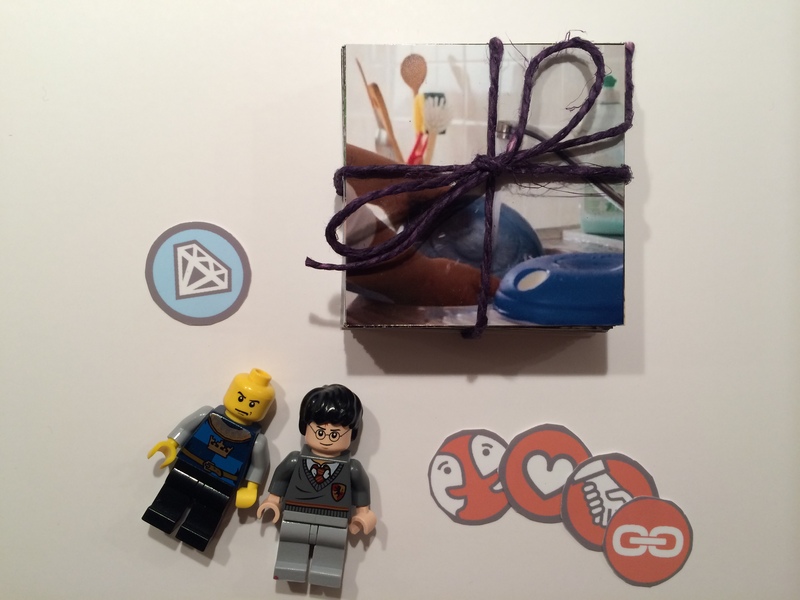 Caroline believes that the «Engagement tool-kit» has potential to be used in other settings. A given example is to use the tool-kit to help elderly map out their day-to-day activities, and see where to insert reinforcements. Other areas that Caroline want to explore in the future, is using the tool-kit in developing countries where visualization is necessary due to language barriers and basic skills. In all cases iterations must be made, based on the applied setting. These examples are based on her background from healthcare and social entrepreneurship. The case company suggested that the «Engagement tool-kit for social businesses», should be used in all the social businesses in FERD´s portfolio, which is Norway’s largest investor within the field Social entrepreneurship. They also asked her to continue to visualize information to their internal and external customers after the thesis project was ended. This shows the power of combining service design with social entrepreneurship, and using visualization extensively in a social business. 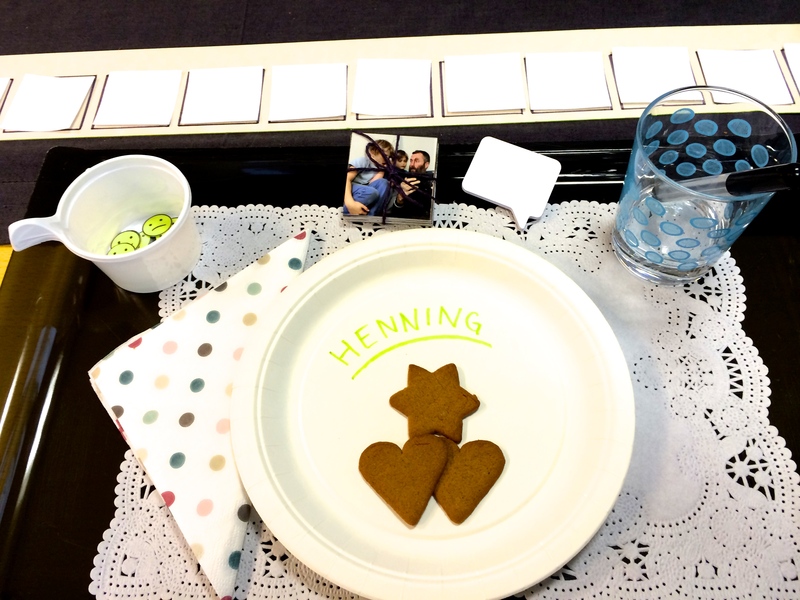 This blog post was presented by Caroline Chaffin, as a press release for her thesis work, that will be published in April 2015. The thesis can be accessed on the theseus data base. The Engagement tool-kit for Social businesses by Chaffin & Hugenschmidt is licensed under a Creative Commons Attribution-NonCommercial-NoDerivatives 4.0 International License. Hi Caroline, i look forward to reading your thesis as i too feel that i am an ambassador for the end user. My experience has been in higher education. Specifically with international students who are often silenced…for various reasons. Great post! Very interesting topic for your thesis. I’ve downloaded you thesis and will read it as soon as I have time. I have just started my studies at Laurea and I find social entrepreneurship as the most inspiring topic where the whole design thinking idea can be implemented. My own background is in development aid field and there are so many possibilities to use design thinking to alleviate poverty, improve the work of the organisations and include companies to work with us in the base of the pyramid market and as social entrepreneurs. Really good post, thank you!